In an a recent interview for a magazine I was posed a question: “Where do you get your recipes?”. I’m not going to reproduce my answer (the interview hasn’t been published yet), but this recipe is perfect for exploring some of it. Inspiration sometimes comes from odd places. But let me mention that these mini-tart shells (tarticos in the DR) are a versatile option for parties as you can fill them with sweet or savory fillings. 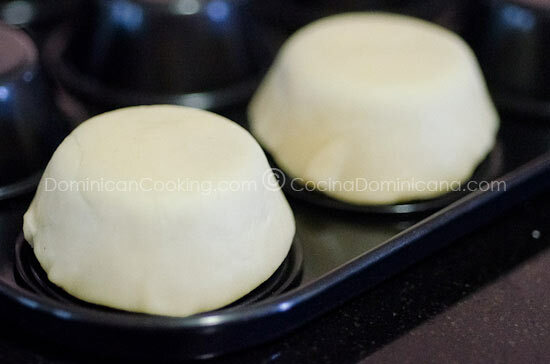 I’ve received many emails and messages from readers asking if I could share a recipe for something that is easily available in Dominican supermarkets. The problem was that I had never done this. Time for my favorite part of cooking: experimentation. After a couple of trials and errors I found a recipe that worked and tasted great. The filling, which frankly I made because the empty shells looked a bit boring in pictures, turned out to be be much better than I thought. The idea was inspired by my late grandfather’s custom of having cheese and fruit for dessert (not as uncommon as you’d think). The cheese I chose is “cremita”, a type of cheese very similar to cottage cheese but firmer and saltier. You can use strained cottage or ricotta cheese if you wish. For the fruit part you have many more options: mango, apples, pears, nectarine, etc. Now that the party season approaches use this for those “bring your own” parties. You can make the parts beforehand and assemble in place. Since this is not a very sweet dish, thus not necessarily a dessert it can be served any time, from breakfast to dinners. I see myself making this more often. Mini-Tart Shells Filled with Ricotta and Fruit Recipe: a great option for parties. It needs 3 ingredients for the shells, fill with sweet or savory filling. Boil the cinnamon in water over medium heat until the liquid is reduced to half. Add the fruit and sugar. Cover and cook over very low heat for 10 minutes (careful it does not burn). Remove from the heat and when it cools to room temperature place in a lidded jar and refrigerate. Heat the oven to 150 ºC [300 ºF]. Mix butter with flour and milk. Mix without kneading more than strictly necessary. Wrap the dough in film plastic and let it rest in the fridge for 30 minutes. Roll out the dough and cut in circles 3.5" in diameter. Place the circles on the reverse side of of a mini-muffin mold, forming the tart shells. 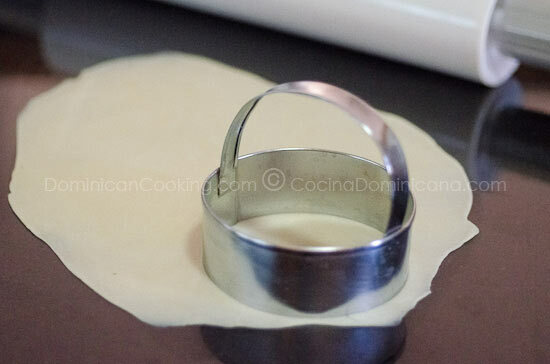 Place a baking tray on top of the mold, to keep the bottom of the tarts flat. Bake for 10 minutes. Remove from the oven and cool to room temperature. Save in a zippy bag for no more than a day. Place a tablespoon of cheese in each shell. Place a slice of fruit on top of the cheese. Pour half a teaspoon of the syrup on top of the fruit. Serve immediately. If you want to save the shells for longer than a day, keep them in the fridge and reheat shortly before serving since the shells get a bit soft in the fridge. Hello Aunt Clara! I really enjoy your website and the food looks delicious. I was wondering, on your Mini-tart shells filled with ricotta and fruits recipe how thick should I roll the tart shell dough? The pictures look thinner than a normal pie crust. I am 14 so I don’t have a plethora of knowledge concerning tart shell thickness. Thanks a bunch, Annie. You need to roll it out about 1/16″, or as thin as you can. The thinner, the crispier. This is a great recipe for me since I am doing the small servings thing to control my intake of food. I will be using this recipe.